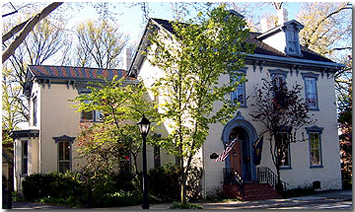 The McLean House is located in the Historic District of Shippensburg, Pennsylvania. It was built in 1798 by Post Master/Merchant Joseph Duncan on a double lot purchased from Edward Shippen, who received the land now occupied by Shippensburg in a grant from William Penn. The property was sold to the McLean family in 1876 and remained in their family for more than a hundred years. The McLeans added several wings and Victorian embellishments. The Roses purchased the property in 1987, and have restored it into a pleasant and comfortable home. Branch Creek, with mallards and trout, bounds the property. Our area is a “junquer’s” paradise with dozens of antique and flea markets and weekly country auctions. Our Amish neighbors are a common sight - most local markets have hitching rails for their buggies.